Social media is where trends are born. New filters, popular hashtags, the biggest influencers, and, above all, the latest marketing tactics almost always start from a few posts or ideas that got major traction on a social media platform. What if, instead of following social media marketing trends that have already become the norm, you could get out in front of the next big thing? By embracing Spark AR and augmented reality within your social media marketing strategy, you can. Read on to learn how to make it your own. First, let’s make sure you’re clear on what AR — augmented reality — actually is. Virtual reality is designed to completely replace your reality. Your office becomes a jungle, your living room the interior of an ancient castle. As the name implies, AR “augments” your reality instead of changing it altogether. For example, AR could make an interactive map appear in front of you so you can learn more about nearby tourist destinations. It can let you try out tattoos, hairstyles, and more. Facebook, Snapchat, and Instagram are already using AR to market services and improve the overall user experience. And AR is only gaining more and more traction in social media marketing and beyond. In fact, AR is slated to outpace revenue from virtual reality marketing tacticsby 2022. Now, let’s talk about the ways in which you can take advantage of Spark AR and augmented reality as a whole in your social media marketing plan. Everyone loves to play around with different filters on social media. They can try out new looks, transform themselves into animals, and highlight facial features. You can give users the chance to do the same thing by creating your own branded filters. Just make sure you include your logo in the corner, or even make one of the filter’s features relevant to the products or services you offer (for example, if you’re a day spa, maybe your filter could put cucumbers over their eyes, include a face mask and put a towel wrap on top of a user’s head. This encourages users to share the photos they took using your branded Spark AR filters, leading to increased brand loyalty and seriously cost-effective marketing. As only shopping only becomes more and more common, many consumers find themselves craving a return to the in-store experience. However, at the end of the day, nothing can really beat the ease and convenience of online shopping. Currently, close to 80% of consumers shop online instead of in brick-and-mortar stores. 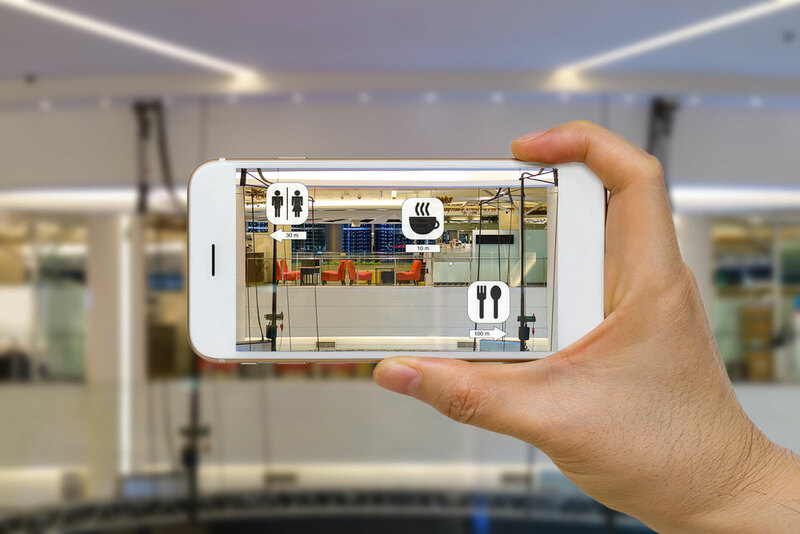 AR on social media can help you imitate in-store shopping by giving consumers the chance to use filters and other AR features to try out your products for themselves. They can see how shoes, jewelry, and other accessories would look with an outfit. They can try on clothing, makeup, and much more. This will lead to much fewer returns, and means buyers don’t have to wait until products are delivered to try them on. Spark AR completely transforms in-app purchase marketing as we know it. Now, users aren’t seeing your products on other social media users, models, and homes. Instead, they see them added to their current reality. Plus, they like your brand and the products you offer that they’ve already made the decision to follow you on social media. This makes impulse buying even harder to resist, and shortens your overall buying cycles. Social commerce even allows you to show users maps of your nearby stores using geo-location services. As incredible as the benefits of social media marketing with Spark AR are? Only about 7% of marketers are currently using AR in social media and other forms of advertising. When you’re ready to get ahead of the trend, reach out to us to learn how we can help you make it happen.